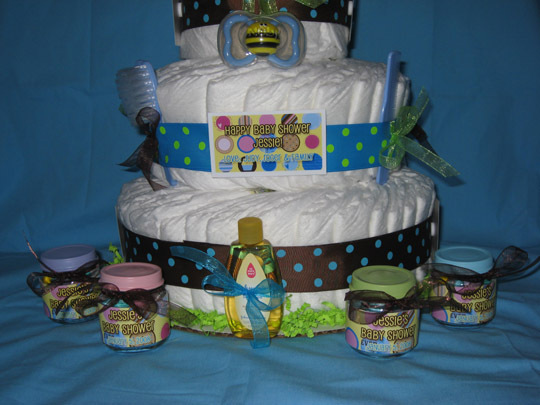 Cute Polka Dot Diaper Cake, Invitations, Favors and More! 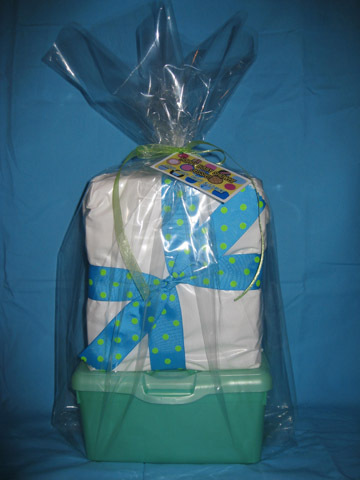 This polka dot diaper cake is coming to us right outta the Aloha State! This is a picture perfect diaper cake with matching polka dot invitations, favors and baby shower gift. I love the Polka Dot theme for a baby shower! It is so cute and hip! 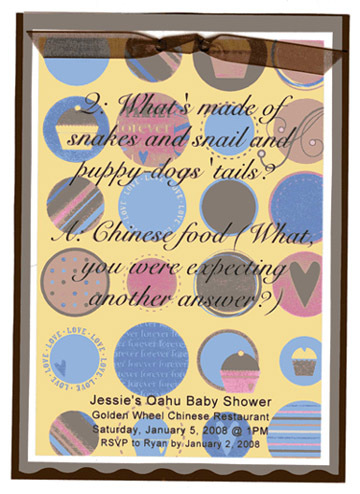 All of these polka dot baby shower ideas was created and submitted by one of our AMAZING readers, Judy! The heart of this website is the collective ideas and creativity that all of our readers have submitted. And Judy has truly enriched this website with her adorable ideas. SO Judy, thank you from everyone who visits this website!! 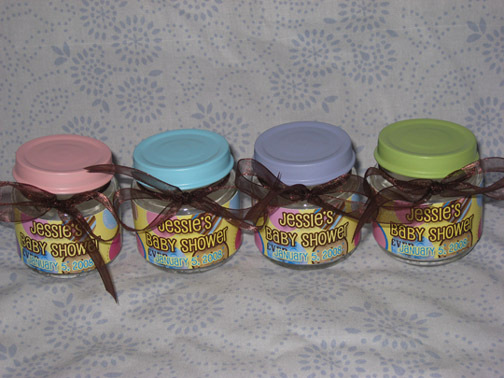 If you have some pictures or ideas of a diaper cake and/or baby shower that you would like to share, submit 'em right here! I used a "layered" method instead of "rolled" method for my diaper cake. (I waited till the last minute to make the cake, so I needed to save some time). -Tape the empty rolls together and glue gun/tape them to the cake circle. -Place the diapers on its side and layer them about 1" apart. Wrap rubber bands around to secure. 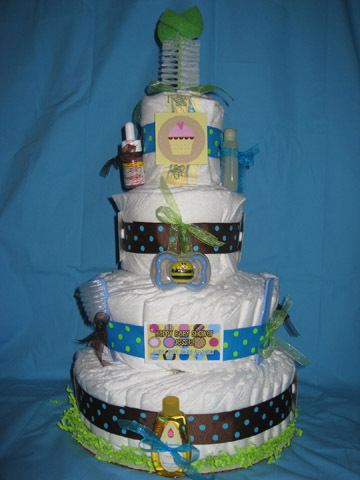 -Number of diapers starting from the bottom tier: 40 / 25 / 10 / 5 -Starting from the bottom tier, place tiers on top of the empty rolls and slide down to the base. Beautiful. Absolutely beautiful, Judy! Thanks for sharing your Polka Dot diaper cake!! Made from vellum, cardstock & scrapbook paper. 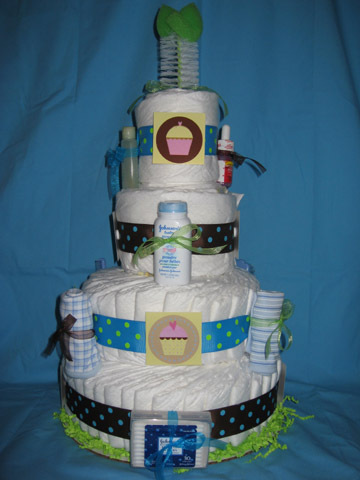 Make a splash at the baby shower by making your own diaper cake! Here are step-by-step, simple diaper cake instructions!